Such an adorable color mix! Such a pretty and girly outfit! Nice combo, I love the pink! OMG love all about this outfit !!!!! amazing combo yellw and pink ! Love this outfit! What great colors on you! These colors are so pretty and bright, it's making think about the summer! Love this color combo! Your bracelets are too cute! I would have never thought of this color combination, but it works wonderfully. So ready for Easter and spring. Love this look on you. What a lovely sweet mix my dear! Love this look! Gorgeous color combo! Great combo of colors! So cheerful and bright. I love the shape of your skirt....so flattering! Simple, elegant. I have the same skirt in white. Dont' you just love it!!!! This color palette is so perfect for spring! You look adorable! I love that bright outfit. 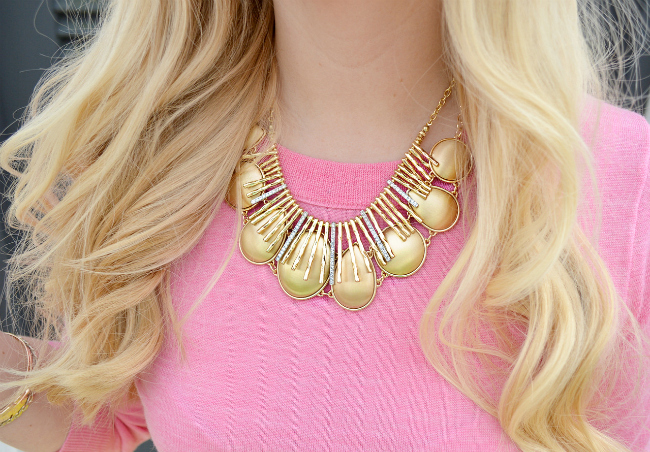 The pink and yellow color combo is perfect for spring! Love this look! Beautiful. Love all of these colors together! perfect colour combo, especially with the gold accessories! Love this! I love how fearless you are regarding colors, wish I could pull this off! Love this look :) the colors are perfect for spring! I really like how you stacked the necklaces. It's simple, but effective. Lovely post, Anna. Really pretty color combo. You look beautiful! Daring colour combintion but I love it! What a fun spring outfit! Love the colors...reminds me of strawberry lemonade! Lovely outfit! Love the color combination! This is so fun Anna! Love the color combo- so sweet! This is so pretty - I am obsessed with the bright colors! Such a fabulous color combo. oh you are just so pretty! such pretty pink lemonade colors! Adoro esas pulseras y el conjunto del outfit , GUAPISIMA !!! Cute skirt. Love the lemon yellow color. Love these two colors together! You look fantastic. LOVE the pink and yellow together!!! Such a fab feminine outfit Anna!! Love the color combination on this look! Love this colour blocking...your hair looks so pretty too! The little lace details on this skirt are so cute! 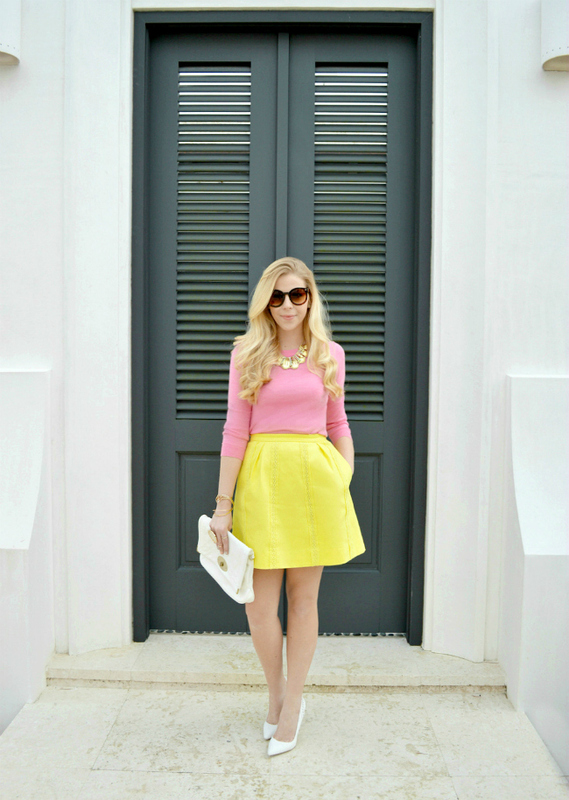 Love the bright yellow and pink combo! Love the pink & yellow combo! Yellow and pink what a great combo!